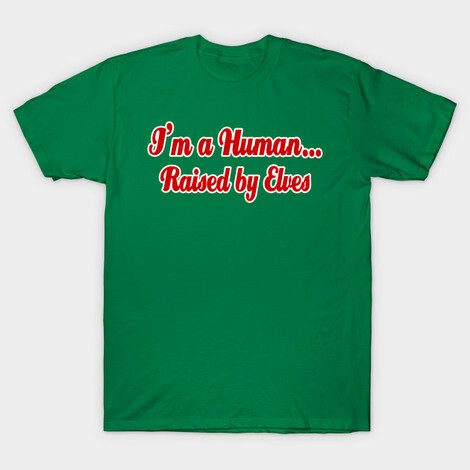 I'm a Human...Raised by Humans t-shirt to own Elf clothing and merchandise. Buy one or both of these designs for the perfect Elf couples costume. Wear them with your significant other as you remind everyone, "The best way to spread Christmas cheer is singing loud for all to hear." That's some pretty insightful advice, but for someone who was raised by elves it is common knowledge. If you wish this lesson had been a part of your standard curriculum then get the latter Will Ferrell t-shirt now. If you grew up with the lesson and have always felt like singing a bit or just listening to some holiday favorites, then the first design is for you. I'm a Human...Raised by Humans tee above, browse the Elf Clothing Gallery for more apparel like men's and women's clothes, kids shirts or hoodies.